Dapper is a micro-ORM for .Net that extends your IDbConnection, simplifying query setup, execution, and result-reading. 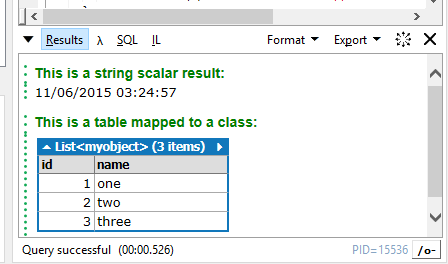 LINQPad is great for testing database queries and includes NuGet integration. To use Dapper in LINQPad press F4 to open the Query Properties and then select Add NuGet. Search for dapper dot net and select Add To Query. You will also want to click Add namespaces and highlight Dapper to include the Extension Methods in your LINQPad query.